Riesling lovers: extinguish the torches, put away the pitch forks and untie the noose. I am here discussing Italian Riesling which is not related to the Rhine Riesling you know and love. 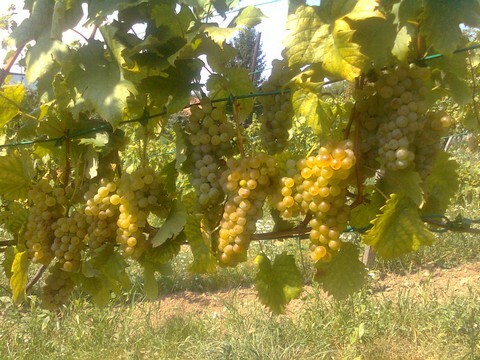 Besides, in Hungary, if one reverses the modifier, the mantel for the white wine of Kings is probably more properly given to Pinot Gris (Szürkebarát). Meanwhile, Italian Riesling (or Olaszrizling in Hungarian which literally means “Italian Riesling”) is still an ancient variety with a long history in Hungary. And since Hungary has a wine growing tradition dating back to the Roman period, it is often claimed that the introduction of Italian Riesling to Hungary comes from that period. But the actual original origin of Italian Riesling to Hungary is obscure. One theory claims it came from the Balkans, and another theory says it originated form the French Champagne region. But one fact is undeniable: at the time of this this post, this ancient grape variety is currently the most widespread grape variety grown in Hungary. This extensive prevalence is actually a rather “recent” event after extensive frost and pests (eg: Phylloxera) decimated the more traditional native varieties that were more common over a century ago. The replanting of Italian Riesling was so extensive in fact that the first vineyard we acquired over a decade ago in the Badacsony wine region near Lake Balaton was mostly Italian Riesling. Italian Riesling in late August. Italian Riesling can make a very good wine. Due to its ancient pedigree and history in the region this variety will always have a place in our vineyards. But we are currently looking into removing some of our Italian Riesling, and replanting with local native Hungarian varieties which make amazing unique wines mostly and completely unknown to the majority of modern oenophiles.